Disclaimer: This is not a sponsored post. I did receive some of the cups featured in this post free from their manufacturer for review; however, all thoughts and opinions about the products featured in the post are solely my own. I did not receive any financial incentive for this blog post or for the products mentioned in the TV segment link contained within. This post contains affiliate links. Your baby's mouth is busy during his first year of life, right? There's the breast or bottle to get used to, for some families a pacifier to perfect and then starting solids at around the 6 month mark. But what's up with cups? Should You Skip the Sippy Cup? But could you skip the sippy cup? As shocking as it sounds - the answer is yes! Speech language pathologists and infant feeding experts make it a point to point out that sippy cups (kind of like pouches) were invented for parents and are not necessary for babies and kids. "I frequently hear from parents how excited they are to begin teaching their baby to use a sippy cup. They often view it as a developmental milestone, when in fact it was invented simply to keep the floor clean and was never designed for developing oral motor skills. Sippy cups were invented for parents, not for kids." As a mom of 7 working in nutrition, this was news to me. Before I had kids I guess I always just thought that a kid can't drink from an open cup, so a sippy cup made sense. But in researching how to transition my own kids to cups cups, I was inspired by Potock's suggested course of action. She recommends, "The next transition from breast and/or bottle is to learn to drink from an open cup held by an adult in order to limit spills or to learn to drink from a straw cup." But Kids & Cups are a Recipe for DISASTER! You wouldn't think it - but this whole ditch the sippy cup saga is actually quite controversial. SLP's who work with children and adults who have feeding disorders often find themselves pitted against parents of kids without feeding problems who just want to minimize mess. The open cups below are the Baby Bjorn baby cups that we love in our house. They're slightly weighted (not suction) and a great portion size for learning how to drink out of an open cup. Click here to buy them on Amazon. So one of the ways I've worked to minimize reliance on the sippy cup in my house is to seek out cups with straws. 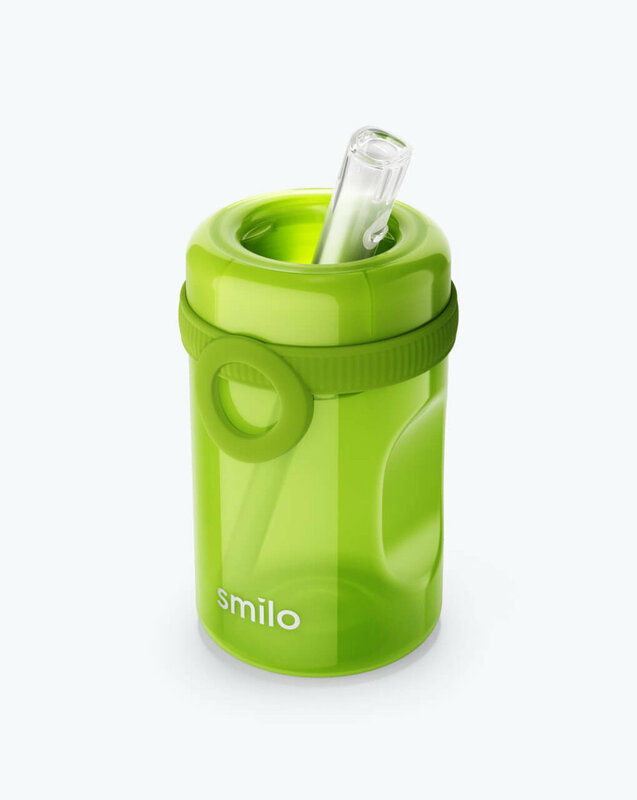 We recently tried out the new Smilo Baby sippy cups. 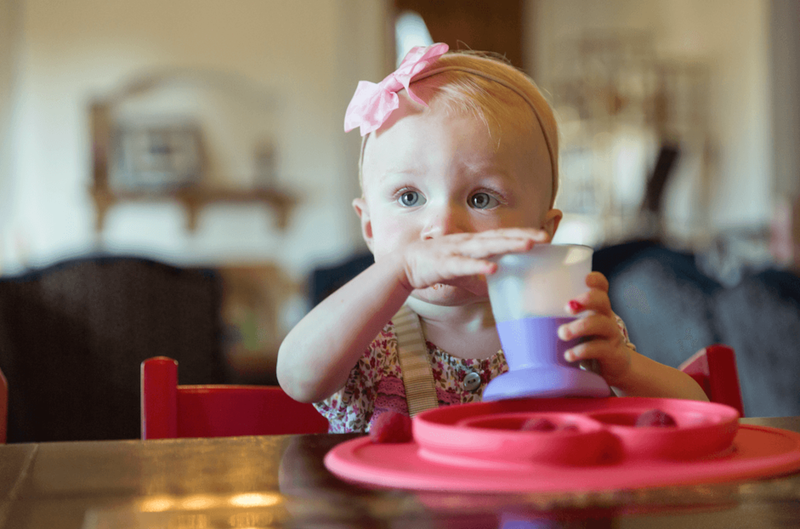 The name "sippy cup" is somewhat misleading because it's a straw cup that sidesteps some of the developmental feeding difficulties sometimes attributed to traditional sippy cups. I like it because as it claims, the cup is leak-free, is made with BPA-free materials and there's nowhere for dirt or mold to hide. Also the soft texture of the straw is pretty unique (I always test out my kids sippy cups myself...is that weird?!) and there's no need to bite down on the spout. Over the past year I've tried out all sorts of toddler cups with my kids...and some are better than others. I put together a list of my favorite toddler training cups (this was before Smilo released their straw cup) that you can download to see what worked for us. If you like sippy cups because they keep your carpet clean when your kid is running around - think about the potential danger this situation presents. In the same blog post cited above, Melanie Potock refers to a 2012 study that found a child in the US is rushed to a hospital every 4 hours due to an injury from a bottle, sippy cup or pacifier. At our house we only offer cups when kids are safely seated at the table. There's no need for a toddler to be dragging a sippy cup around your house, the car or the park. This helps cut down on finding fermented milk cups under your couch too. Below the seats that the kids are sitting in are the Summer Infant Pop 'n Sit Portable Boosters (click to buy on Amazon here) and the cups are the Baby Bjorn baby cups (click here to shop on Amazon). Contrary to popular belief, kids don't need juice (check out my post "No Your Baby Does Not NEED Juice"...and my personal favorite NYT op-ed "Seriously, Juice is Not Healthy"). In fact, the two best things for you to serve in a toddler cups are milk and water. That's it. No soda, no juice, no vitamin enhanced kid drinks. Milk and water. Keep it simple sister. One of the thing that bugs me about kids cups is they tend to be enormous compared to what kids actually need to drink. I usually serve 2-4 oz portions of any liquid from an open cup a few times a day, but some kids cups are 12-16 oz., which can encourage over serving milk (or juice, etc.). Worried about dehydration? Yes, you should offer more water if your kid is constipated, or when the temperature heats up outside. To gauge hydration status - keep an eye on the color of your kids' urine: lighter color or clear is good, dark yellow and pungent smelling means they're not getting enough fluid. I try to serve a lot of high water content foods like fruits and vegetables for my toddlers. Keep in mind that foods provide fluid too. Kids have varying levels of thirst sensation or inclinations to ask for water. One of our quadruplets is ALWAYS asking for milk, whereas another one never does but will drink whatever he's offered. If you're worried about the mess caused by an open cup, try offering fluid after food. This will help your baby or kid focus on the food on the plate, but still have the opportunity to drink from an open cup. Based on a recommendation from another SLP/feeding expert friend, I am going to start offering my twins the opportunity to drink from an open cup starting when they are 6 months old. Making family rules and boundaries about kids and cups is hard, because there's not a ton of research on the topic. 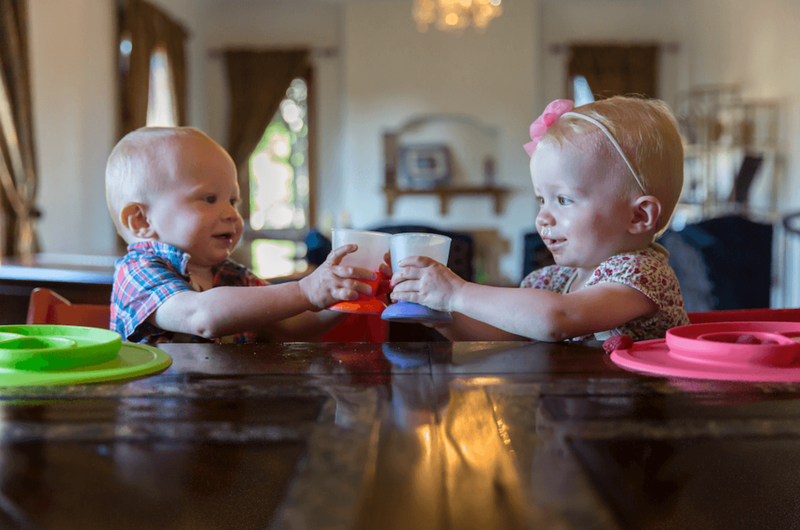 SLPs who are feeding experts cite many anecdotal instances of how cups can interfere with normal swallow and speech development. Although I'll admit we at times turn to sippy cups (for my sanity), I 'm working on getting my kids comfortable with an open cup as soon as possible. I'd love to hear what works for you - share your cup strategy in the comments below. Milk and water are the only thing kids need to drink...everything else is a "sometimes situation"
If you want to check out more skipping the sippy cup action, here's a recent TV segment I did on why you MIGHT consider skipping the sippy cup step!